Now that the year-end holiday period is over, let’s focus on one of France’s flagship products: champagne. Still synonymous with luxury, conviviality and partying and driven by strong international growth, it is managing to resist the financial crisis rather well. 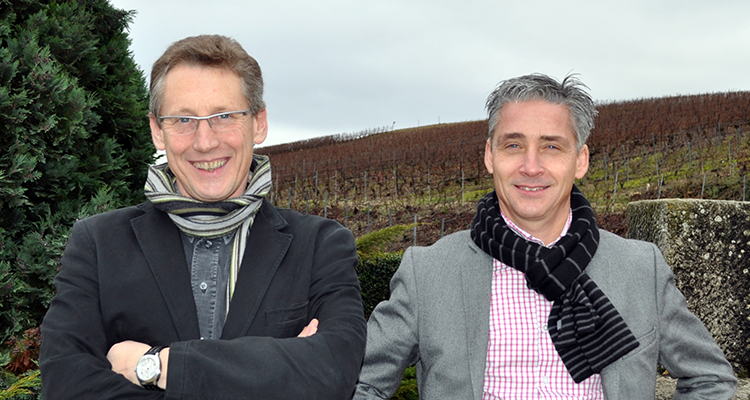 Among all the winegrowers, cooperatives and hundreds of champagne houses, one of them is particularly prestigious. Founded in 1743, Moët & Chandon is undoubtedly the brand whose corks ‘pop’ most around the world! Its address, Avenue de Champagne in Epernay (51), is a symbol of its prestige and has played host to many crowned heads and celebrities, but a major part of the success of its bubbly nectar is based on what happens underground. Descend into the depths and you will find an extensive network of caves in Champagne, carved out of the chalk during the 18th century. 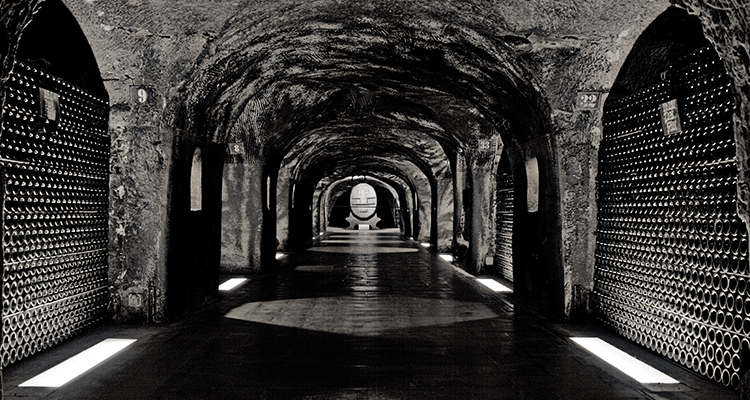 At a depth of 30 metres, corridors, galleries and cellars open out and intertwine on several levels. 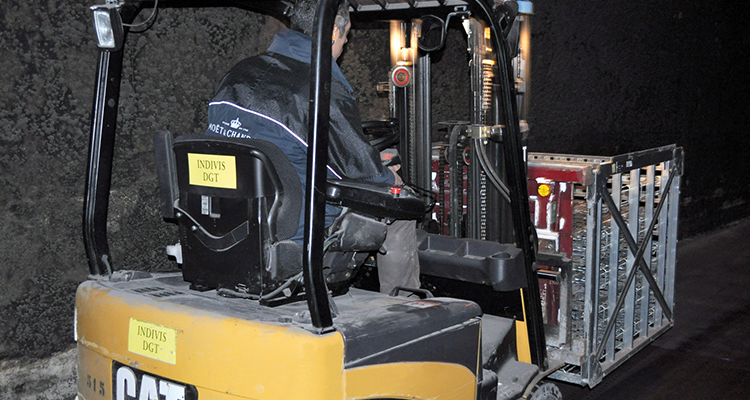 The silence of this 28km labyrinth of dark caves is only disturbed by guided visits on an organised circuit or by the comings and goings of some 220 materials handling machines. Around one hundred 1.6t Cat® forklifts cross paths with 75 Spijkstaal Tractors, as well as 29 vehicles used for transporting people and 15 warehouse trucks – pallet trucks and stackers. 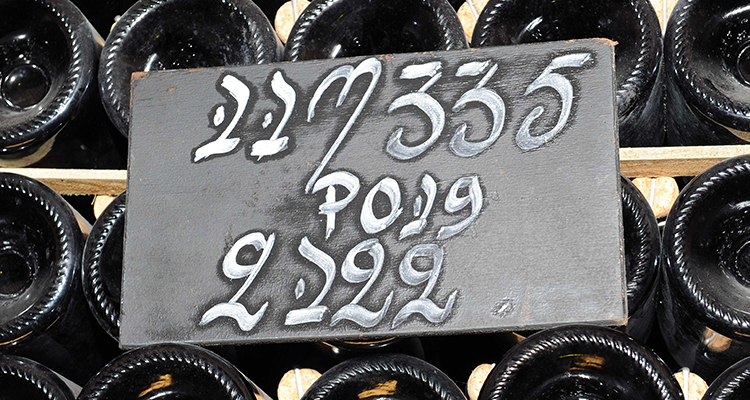 Their role is to move and transport the Moët & Chandon bottles stored here to mature for a minimum period of 15 months. All are electric – to avoid emissions, smell and vibration in this sensitive enclosed environment. The machines will soon have something else in common: long-term rental. With nearly half the fleet currently still owned, Warehouse Maintenance and Handling Depot Manager Thierry Manteau intends to optimise fleet organisation and reduce costs. How? By strengthening his partnership with Aprolis, currently responsible for the other half of the fleet which is on long-term rental. Their know-how, as an exclusive dealer of Cat® lift trucks and as a leader in the rental market for multi-materials handling in France, is already a guarantee in itself. Since 1985, Moët & Chandon has wanted to include a second truck manufacturer to diversify the fleet of Fenwick trucks that it already owned. Having tested trucks from the main brands on the market, the decision was made to go for Cat® lift trucks. 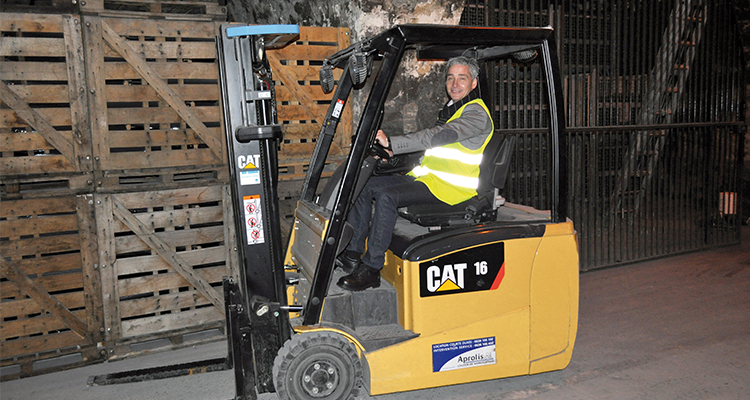 In early 2000, Cat® became the exclusive brand of forklift trucks used by Moët & Chandon. Then in 2007 the champagne house decided to go even further and put all its lift trucks on long-term rental. This trust, explained Aprolis account manager Pascal Demange, is due to the specific offering proposed by his company. “We can rent and maintain anything that rolls, from tractors through to warehouse trucks and cleaning machines. We are extremely versatile and our customers have a single service provider to meet all of their needs. This makes them feel comfortable.” So, because it is ‘impossible’ for Thierry Manteau, “to contemplate service not being provided and machines immobilised”, three Aprolis engineers are permanently located on-site. From their dedicated central workshop, they provide preventive and curative maintenance for the whole Epernay fleet. Service levels are further increased during harvests. These are always carried out manually and in accordance with tradition over a period of around three weeks between the beginning of September and the end of October. During this time the Aprolis short-term rental takes over. 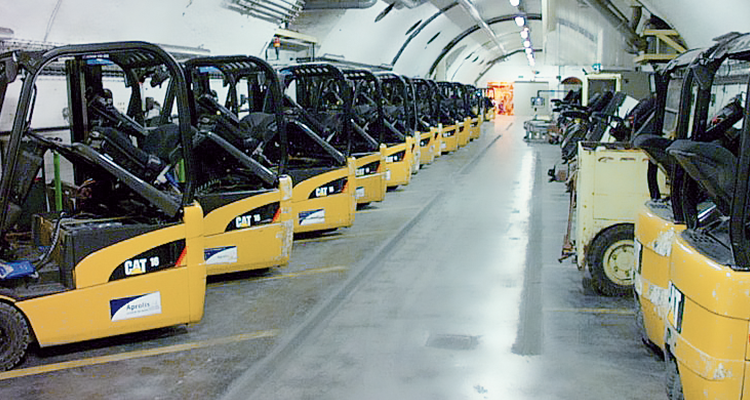 Forty-five gas-powered lift trucks are used in pressing centres across the whole of Champagne region to transport the grapes to the press. The 1,100 hectares of Moët & Chandon vines comprising the largest vineyard in Champagne, makes up part of this supply, the rest being bought from winegrowing partners. Knowledge of the sector and the people who work in it enables the Aprolis team to be as in-tune as possible with its customers’ needs. “They are partners both on a day-to-day basis for specific business requirements and issues, as well as in their development proposals,” Thierry Manteau is pleased to report. discussion on the use of oil for the entire fleet, etc. It is true that the champagne house has been practising an effective environmental policy for several years. In particular, Moët was the first of the LVMH Group to implement sustainable development management and boasts ISO 22000 and 14001 certifications. Although the global market for champagne recorded a decrease of 5% for the first nine months of 2012, exports are boosting sales. In 2011, nearly 330 million bottles were shipped worldwide: this represents +32% in Australia (4.9 million), +24% for Russia (1.3 million), +19% in China (1.3 million), +14.4% for the United States (19.4 million), +7% for Brazil (more than 1 million) and +6.7% in Japan (7.9 million). Source: Comité Interprofessionnel du Vin de Champagne (CIVC). It should be noted that for Moët & Chandon, the world’s leading brand in terms of sales, 2012 sales are on the increase, with two major customers – the USA and Japan – and one country that is gaining ground – China. 80% of group production is intended for the export market. New generation EP16CNT electric truck. Turning up to 50,000 bottles per day by hand! Something that seems to be out of a science fiction film is nevertheless the reality for David Vincent and his two ‘turner’ colleagues for champagne house Moët & Chandon. When sufficiently mature, turning helps to remove the sediment that makes champagne cloudy. A traditional champagne technique, it consists of turning each bottle neck-downwards to make the sediment flow down into the neck and thus make it possible to expel the sediment entirely. For financial reasons, manual turning, still carried out for the great vintages, is increasingly being replaced by mechanical pallet turning. 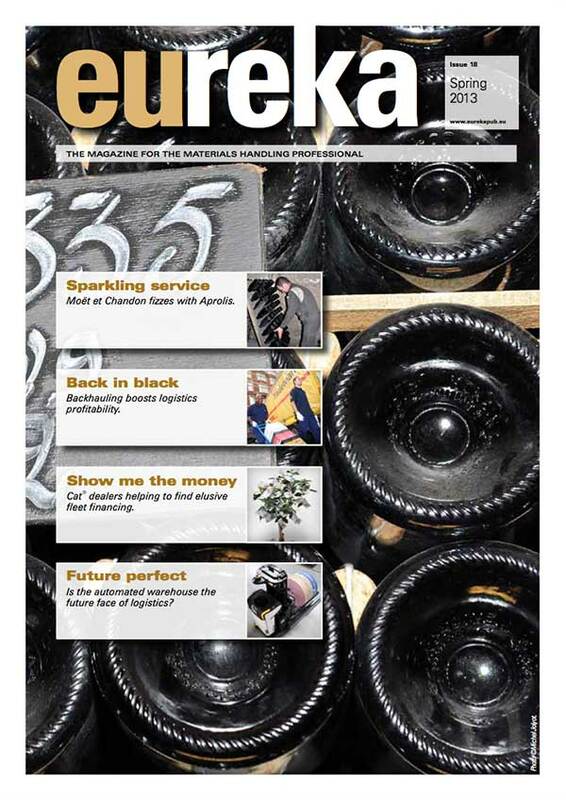 This article appeared in the 2013 Spring edition of eureka magazine.